KETTON No.1 – KETTON PORTLAND CEMENT Co Ltd., Ketton Quarries, Rutland. This small locomotive was supplied on the 4th April 1960 to the Ketton Cement works to replace the fleet of old steam locomotives and despite being a modern motive power unit, was specified with sprung “Dumb Buffers” for working with the Victorian side tipping wagons used in the quarry railway to deliver raw materials for the cement works. The locomotive still has its original Leyland 176hp diesel engine and a stick change gearbox which gives a ride sound reminiscent of a vintage bus! The locomotive gave loyal service at Ketton but after a period out of use was isolated on a length of track within the works. Looking woebegone under a layer of accumulated cement dust, now set hard, the loco was eventually donated to the Museum as a representative of one of the few non-ironstone rail served quarry systems in Rutland. The loco arrived on 24th March 2005 and was started up and run for the first time only a few days afterwards. 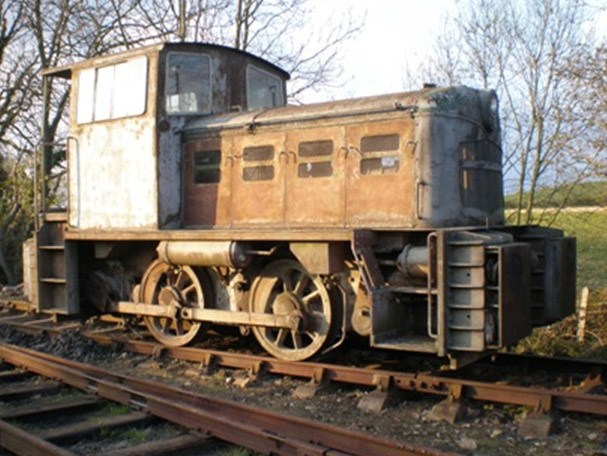 The loco is now displayed in its ex-industry condition but patiently awaits its restoration and return to operational service.